Valentina Ivanovna Matviyenko, Chairman of the Russian Federation Council, met with Chinese and Russian journalists in Wuhan on September 8, 2016. 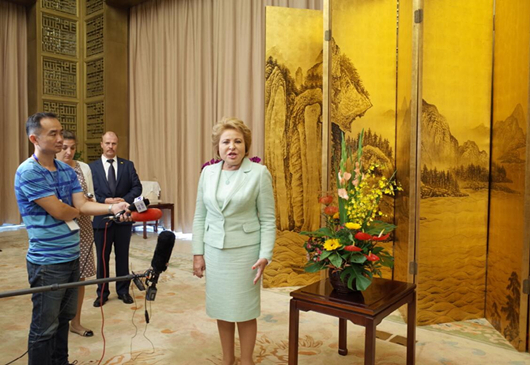 Valentina Ivanovna Matviyenko, Chairman of the Russian Federation Council, confirmed that Russia is to establish a consulate general in Wuhan, capital of central China’s Hubei province, on September 8, 2016. Wuhan and Russia have seen expanded economic and trade cooperation since 1990s. In 2013, bilateral trade volume reached 183 million U.S. dollars. Wuhan enterprises have invested more than 10 million U.S. dollars in Russia, and 12 Russian enterprises are making investments in Wuhan. The direct air route linking Wuhan and Moscow also greatly facilitates mutual exchanges.